Of course, next month is the last show of the year and will be filled with dealers and their numismatic and exonumia displays. Visit the show to find that perfect gift for the holiday season for someone on your list or for yourself. You can buy, sell, trade or browse among the many different numismatic and other collectibles on display. Once again the dealers will fill their showcases with a wide variety of coins, currency, bullion and other collectibles. Join us on Sunday, December 10, 2017, for the next Greater Atlanta Coin Show. The November 2017 monthly Greater Atlanta Coin Show enjoyed a bourse filled with dealers and their numismatic treasures with many guests visiting on a cool and somewhat rainy fall Sunday. We appreciate all of our visitors, our dealers, our security and the hotel staff for making another successful monthly coin show. Thank you to one and all. The weather outside had temperatures in the upper 40s with maybe an increase to low 50s in the midday hours. The wet drops didn't fall all day, but there were some good showers in the afternoon. Inside, well, the weather there was cool too. We made several trips to the front desk asking for warmer temperatures. They had management addressing the issue, but it was probably a case of not being able to find the right resources on a Sunday to fix the HVAC system serving the conference rooms. The medical event next door also experienced cool temperatures during their conference. The hotel will be busy with holiday parties soon and will need warm facilities. Once again, the hotel hosted a wedding during the coin show. This month, it was an Indian wedding. In the past, they've had an elephant as part of a wedding ceremony. We did not see one this month. Based on the early morning parking situation, the hotel was certainly busy during the weekend, however by the end of the show, many of the vehicles had departed. All in all, the coin show was a busy place to be for dealers and visitors alike. Let's take a look at just a few of the collectibles on this month's bourse. We'll start with another one for the ferroequinologists (just enjoy that word), but in reality it's more for the vintage tchotchke collectors. 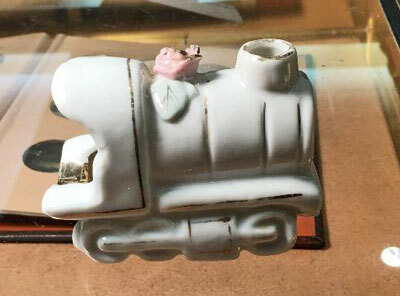 The little white locomotive is small, measuring just 3.5 inches long, 1.75 inches wide and 2.5 inches tall. A pale pink rose with pale green leaves decorates the top of the engine behind the smoke stack with gold trim on the rose, leaves and the sides of the locomotive. Of course, when a lit cigarette is placed in the ash tray portion of the little locomotive, smoke furls out of the smoke stack like a steam engine. 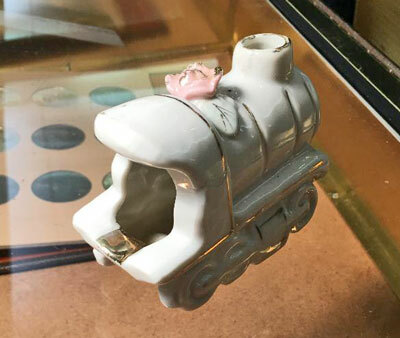 These locomotive ash trays were made in Japan and imported in the 1930s and 1940s. Some of them have the maker's mark of Nippon Yoko Boeki Co. of a wreath with a bow at the bottom and surrounding a clover. Japan is printed below the wreath. Others just have the word "Japan" stamped on the bottom in red. "Nippon is an English word approximating a pronunciation of the Japanese word for Japan, but in 1921, the word was ruled Japanese in origin, so Nippon was no longer accepted by U.S. Customs Agents. From then on, imported Japanese china was stamped Japan. "Today, Nippon-marked porcelain tends to have a higher value than pieces marked Japan, which means collectors should be wary-demand for Nippon porcelain has created a market for pieces with fake transfer-based marks." 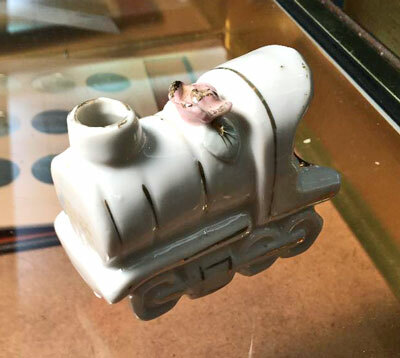 This little locomotive would be a great addition to a vintage porcelain collection. This month, three beautiful Australian collectible coins found their way to the bourse and to our camera lens. 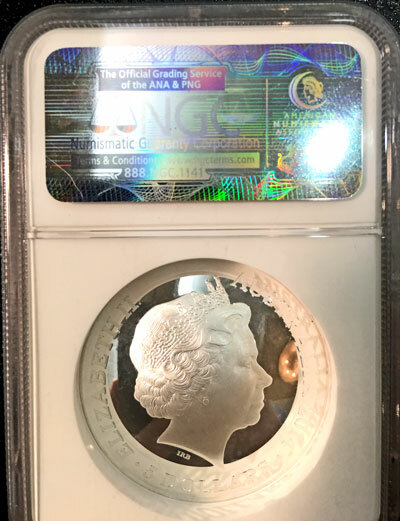 NGC (Numismatic Guaranty Corporation) certified each of these coins as Early Release, Proof 70, Ultra Cameo coins. One of the challenges of these coins is their curved dome shape. But, this shape lends itself to a beautiful portrayal of the southern hemisphere's night sky. Each of these domed coins were minted as proof quality with a face value of $5, and each of the three had a maximum mintage of 10,000. The Royal Mint added the color for the southern skies to the coins consisting of 31.1 grams or one troy ounce of .999 fine silver and a diameter of 39.6 mm. 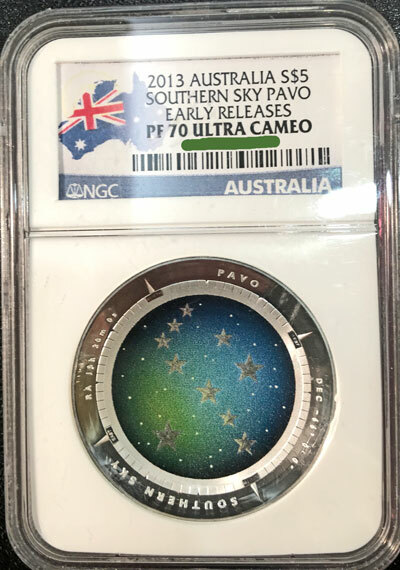 Much like the US Mint's commemorative coins, these Southern Sky coins by the Royal Mint are legal tender coins, however their value lies in their metal content and the beauty of the designs for the collector markets. "Australian coins are struck with an image of the reigning monarch as their obverse design, commonly referred to as the 'heads-side' of a coin. "The inclusion of an effigy of Her Majesty Queen Elizabeth II on the obverse of Australia's coinage is mandated by Regulation 4(c) of the Currency Regulations made under the Currency Act 1965. "Since her coronation in 1953, five effigies of Her Majesty Queen Elizabeth II have appeared on the obverse of Australian coins. Previous effigies were designed by Mary Gillick (1953), Arnold Machin (1966), and Raphael Maklouf (1985). "Since 1998, Australian coins have used the current effigy by Ian Rank-Broadley. During 2000, Royal Australian Mint designer Vladimir Gottwald's effigy was used on the 50c Royal Visit coin. "All the portraits of Her Majesty have faced to the right in line with a convention, said to have commenced with Charles II (1660-1685), that the new Monarch's portrait would face in a direction opposite to that of their predecessor." The next three coins all have the same obverse design. The Royal Australian Mint describes their designs from the obverse to each of the three reverse designs for the Southern Sky coins. The obverse on these collector coins used the same design by Ian Rank-Broadley as those found on their circulating coinage. The Crux constellation, otherwise known as the Southern Cross, is one of the smallest and brightest of the eighty eight modern constellations. One of the most visible features of the southern night sky, its name is the Latin word for cross as it is predominately a cross-shaped cluster. Its famous shape now adorns Australia’s first domed coin, crafted by the Royal Australian Mint. This beautiful $5 coin acknowledges the significance of the Crux constellation, an image that is present on the flags of Australia, Brazil, New Zealand, Papua New Guinea and Samoa. It also played a crucial role as the symbol of the Eureka rebellion and consequent Battle of the Eureka Stockade. For centuries, this constellation has served as a navigational beacon for sailors of the southern seas, and is one of the easiest to identify in the night sky. This innovative dome-shaped coin is packaged in a presentation tin. The insert for the case has been designed in such a way that the coin can be presented standing upright for all to see. In Greek and Roman mythology, the peacock was sacred to Hera (or Juno), Goddess of Women and Marriage - who was also the wife of Zeus; she was said to have adorned the tail feathers of the bird with the thousand eyes of her giant servant, Argus Panoptes, as a tribute after he was slain. The constellation is said to depict a male peacock who has erected and fanned out his train, drooped his halfopen wings to his sides, and is strutting and prancing from one foot to the other, shivering from time to time. This produces a spectacular shimmering, psychedelic display - and an amazing coin. Just as the peacock is a symbol of the greatness of an ancient Goddess, so is the Pavo coin a symbol of the Mint’s continued commitment to produce breathtakingly innovative collectible coins. The coin has been expertly crafted by Mint designer, Aaron Baggio, and shows the Pavo constellation as it appears in the early night sky. The celestial coordinates of the starry image encircle the outer rim of the coin. 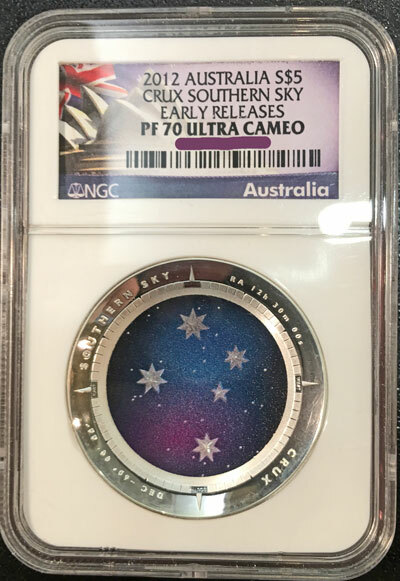 Following the sell-out success of our 2012 Southern Sky Crux $5 Colour Printed Domed Coin, the Mint is releasing 10,000 of these innovative and imaginative coins to collectors. Staying true to the legend of Orion, the giant hunter from Greek mythology, the constellation bearing his name dominates the night sky. Despite being named after a hunter, the Orion constellation is not inconspicuous - its location on the celestial equator ensures it is visible from anywhere in the world. This exquisite silver proof, domed shape and colour printed coin perfectly depicts Orion’s distinguishable stars amongst the dazzling colours of the universe, emulating its presence in the celestial sphere. As one of the most recognized and prominent constellations, it is only fitting to have Orion’s stars adorn the third and final coin from the award-winning Southern Sky series. 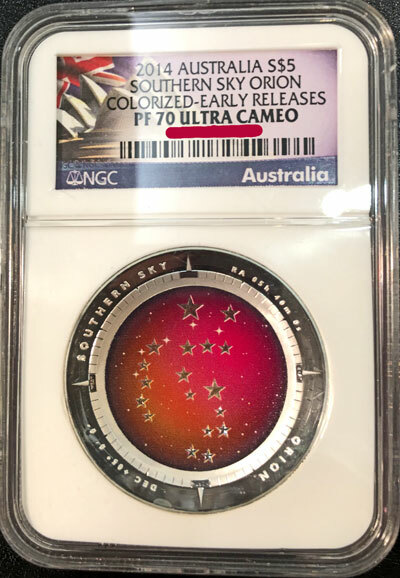 Those three coins complete the Royal Australian Mint's beautiful Southern Sky Series - valuable in beauty, silver metal content and limited production.